This is an intriguing attempt to explore Paul’s many distinct personality traits, as a man at turns masterful, vengeful, proud, hateful, and brilliant. 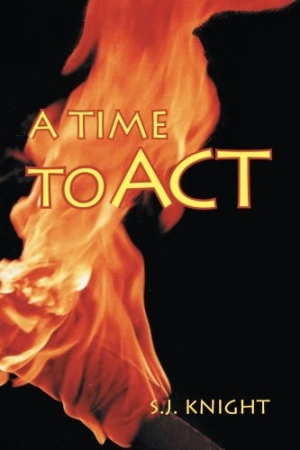 In S. J. Knight’s A Time to Act, the life of the apostle Paul is chronicled from his birth through to the end of his first missionary journey, offering a fictionalized account of the first four decades of his adventures vividly rendered in a sweeping tale that combines themes of self-identity and religion. The book explores the years of Paul’s life that are a matter of historical record, if details related to Paul specifically are scarce. The book fills in those gaps by crafting an ambitious portrait of this person whose writing profoundly shaped Christianity. As a child, Paul is shown as a gifted yet tormented student; later, he is a fiery rabbi bent on preserving the Jewish religion, until a vision of Jesus alters his mission. This vision leaves Saul, written here as Shaul, blind. After the disciple Ananias restores Shaul’s sight, he converts to Christianity as a fervent believer, joining the other disciples in spreading the new religion. Though these events occur in the New Testament, in A Time to Act, Knight explores the possible months and years leading up to them by crafting hypothetical situations that help build Paul’s complex personality, such as scenes from Paul’s childhood where he is routinely bullied by classmates for his brilliance. His intellect is a great service to him later in the book, when his conversion work brings him into contact with mistrusting nonbelievers throughout the ancient world. The story unfolds at a surprisingly quick pace, especially for this six-hundred-page volume. Paul moves quickly from one adventure to another, and the first forty years of his life are full of excitement, including war, religion, and miracles. Most of the major characters, such as the Christian disciples Ananias and Barnabas, appear in the New Testament, and they are well developed here: Paul is impetuous, fearless, and brilliant; Barnabas is Paul’s gracious sidekick; and various Romans are nasty and cruel. It’s easy to follow the story, and the author’s style is simple yet direct—no unnecessary words or flowery phrases, but the tone is passionate and earnest as Paul and his companions travel across oceans, visit flourishing cities, and convert open-hearted people to the new religion. The dust jacket image—a massive flame leaping into a black sky—is an apt allusion to both Paul and the tumultuous adventures in the book. Through its examination of Paul’s adventures converting nonbelievers, the book is also about how he reconciles his own conversion to Christianity with his Jewish upbringing. This is an intriguing attempt to explore Paul’s many distinct personality traits, as a man at turns masterful, vengeful, proud, hateful, and brilliant. Failure, redemption, and self-identity are thoroughly explored through explosive storytelling and historical dramatization that will make A Time to Act an appealing selection for conservative Christians interested in a new look at Paul the Apostle’s upbringing.